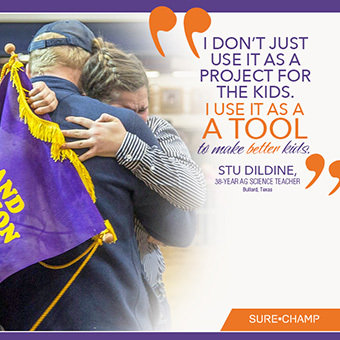 For Cody Jensen taking chances and getting involved has opened many doors. One of the biggest doors opened for this young Kansas native when he decided to run for the National Junior Hereford Board, a decision he made at the last minute, and was elected. Through his involvement on the board, he eventually was elected to serve as its chairman where he met Bob & Lisa Norton, President and Vice President of BioZyme® Inc., supporters of the Junior National Hereford Expo. That meeting, along with a degree in Feed Science Management from Kansas State University, helped land a position as Quality Assurance & Production Efficiency Coordinator with BioZyme. Jensen had been employed by the company for just six months when he had a bright idea for a new product. 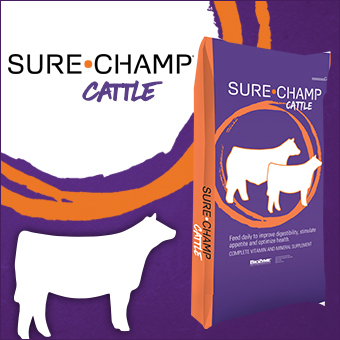 He did research, took his idea to Lisa Norton and after months of formulation and testing, Sure Champ® Climate Control, one of the hottest items to hit livestock exhibitors’ show boxes this summer, was developed. Jensen had taken some vacation time to help friends at the Charolais Junior National in Springfield, Mo., where he says the temperature was a “blistering” 95 degrees with 95% humidity. And the fairgrounds there lends itself to extra heat as it sets in a valley with minimal air movement. He remembers thinking how hot and miserable the cattle looked as they unloaded. “As I watched cattle get unloaded off the trailers into an environment with very little air movement and crazy warm temperatures, it made me immediately think there has to be some market potential for a product to keep these animals cooler to get them to stay in show condition,” Jensen said. He thought about the challenges he experienced that week and drove back to Northwest Missouri all the while contemplating what he could do to make the cattle more comfortable and cool. He did a little research on available products and found that other than using Melatonin, there were not a lot of options available in the marketplace. He continued to do his research and when he was ready, he proposed the idea to Lisa, and the wheels of action started turning. Jensen started working with Kevin Glaubius, Director of Nutrition and Regulatory Support, to formulate a product that would achieve Jensen’s goal – cool animals down naturally under stressful circumstances and keep them eating and drinking to feel their best at the show. He said it was tricky at first since pastes are hard to get to a correct consistency and are temperature sensitive. Once everyone was pleased with the formula, they started providing samples to people they knew who would help test the product in the real world. One success story that Jensen was thrilled to share and never expected was how Climate Control helped reduce shrink on some steers going to a Texas Major. He said the exhibitor was shocked that the steer didn’t lose as much weight, took the heat better and handled the stress better, all causing it to look better at the show. Jensen said although he had created some things to make life easier and more efficient in his own show barn at home, he has never been involved with anything of this magnitude. He said it is exciting to see multiple people across species using the product and seeing the benefits of it. He encourages others with a new idea to think it through and then follow through.